Two innocent black men paraded in handcuffs at a Philadelphia Starbucks claiming they refused to leave when asked by staffers and police in an incident. The incident was captured on camera and prompted the chief executive officer of the coffee company to say the "reprehensible outcome" should have never happened. The incident occurred at Starbucks on Spruce Street near South 18th Street, Philadephia. Starbuck's CEO, Kevin Johnson released a statement apologizing on behalf of the company and hopes to meet with the two men to "offer a face-to-face apology." "The video shot by customers is very hard to watch and the actions in it are not representative of our Starbucks mission and values. Creating an environment that is both safe and welcoming for everyone is paramount for every store. Regretfully, our practices and training led to a bad outcome -- the basis for the call to the Philadelphia police department was wrong. Our store manager never intended for these men to be arrested and this should never have escalated as it did." Johnson said. 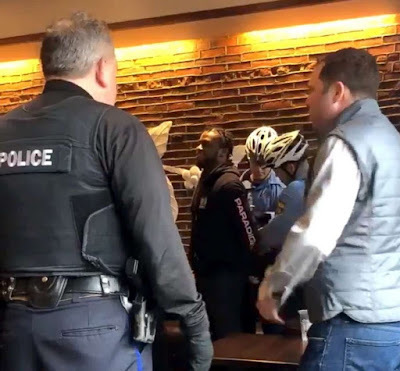 50-year-old Melissa DePino, who captured it on video said Starbucks manager shouted from behind the counter at the two black men to buy or leave. "They were sitting quietly minding their own business, and waiting for their friend to come." 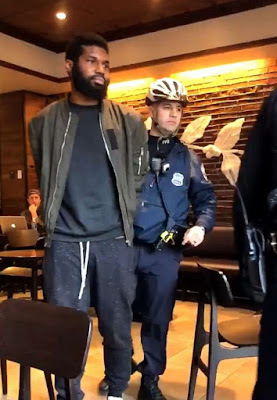 DePino who appeared appalled by the stereotypic incident vows not to visit Starbucks anymore. "Plenty of other local places to go." "I’m very concerned by the incident at Starbucks. I know Starbucks is reviewing it and we will be too. @PhillyPolice is conducting an internal investigation." The mayor put out another statement saying he was "heartbroken" to witness what "appears to exemplify what racial discrimination looks like in 2018." "For many, Starbucks is not just a place to buy a cup of coffee, but a place to meet up with friends or family members, or to get some work done." Philadelphia Police Commissioner Richard Ross Jr. posted a detailed account of the incident, in which he defended his officers' actions. He assured the public that he has gone over the facts and limped to the cops' defense, saying they "did absolutely nothing wrong." "I can tell you candidly these officers did a service they were called to do." "They didn't do anything, I saw the entire thing, what did they do wrong?" said one white man, who questioned the arresting officers. Clearly outraged, DePino took to twitter to vent her anger at saying it was racially unjust. "We apologize to the two individuals and our customers for what took place at our Philadelphia store on Thursday." Johnson, the CEO, said the company will begin to take a look at its policies to for necessary updates on treating customers. "We have immediately begun a thorough investigation of our practices. In addition to our own review, we will work with outside experts and community leaders to understand and adopt best practices." "And so they asked the two males to leave and they refused to leave and the police were called." "Go ahead and call the police. We don't care." One of them allegedly took a verbal jab at the cops saying, "You don't actually know what you're doing. You're only a $45,000 a year employee." Ross said in the video. "On three different occasions the officers asked the two males politely to leave the location because they were being asked to leave by employees because they were trespassing. Instead the males continued to refuse as they had told the employees and they told the officers they were not leaving." The commissioner uncle Ruckus also stated that he was speaking "as an African American" beyond being the top cop and that he was "very aware of implicit bias." "We do this because we want people, our officers, our recruits to understand the minute they come on board to know about the atrocities that were committed by policing around the world." Sometimes fear of police officers protesting can make these commissioners speak in favor of them... You can't give your officers pass for wrongly handling a situation - reprimand them it'll make them understand their role better! !